Right now there are two popular styles of newborn photography. The first style is that posed look where everything is perfect, the baby is usually wrapped in something fluffy, and propped in a perfectly baby sized basket. This style is super popular right now. The other style is more of a lifestyle feel, where the family is naturally interacting with the baby in the family's house. Families can get great photos either way. My own personal style is the latter, a more natural lifestyle feel. Below are some good tips and tricks to get great lifestyle newborn photos. Most lights inside houses are warmer temperatures, like soft white. While these warm temperatures make a house feel nice and cozy, they aren't great for portrait photography. They tend to make people look like Simpsons characters. So, whenever possible, flick off the lights in the room. Use this in combination with the next tip. Photography is all about light, the more the better. So, plan to shoot during a time of the day that gets the best light in the rooms you are planning on using. Open all of the shades all of the way and stand near the window. You can use a window in a few ways. Use it to light up the room. You can stand in front of it to get night soft light. And lastly, you can use it as a backlight to make a great silhouette. Are you sensing a theme here? Hint: It's light. Sometimes there just isn't enough natural light in a room to take a photo the way you want to take it. I like to throw a flash on top of my camera and bounce it off a wall or ceiling for some additional fill light. Just be mindful of the color of the wall you are bouncing the flash off of. If they aren't a neutral color, then you'll probably want to use a light modifier instead of bouncing. This might be self-evident, but I think it's worth pointing out. Newborn photography takes lots of patience. Sometimes newborns cry, eat during a session, spit-up on outfits, etc... These happen every session and there is really no controlling it. Sometimes it's best to just take a little break and start again in a few minutes. To me, there is something so perfect about a newborn snugly swaddled up in a nice light colored swaddle. The swaddle is great because it hides blotchy skin, and belly buttons that haven't yet healed, and dry skin, and everything else. When you wrap a baby in a swaddle, they should be super tight.... like Cuban cigar tight. Of course you want a few photos of everyone looking at the camera. After you get those, have the parents interact with the baby. Look at him, give him kisses, rock him, babble at him. Snap photos all along the way and you'll wind up with some great natural photos. This is definitely personal preference, but I like to ignore the in-camera light meter and shoot my newborn photos in a high-key. I love that look where the entire room is awash with light. Keep in mind that this obviously isn't always appropriate. For example, silhouette photos need contrast by definition. Most times, I walk into a house for a newborn session and it looks like a bomb went off. Organizing the house is the last thing on the mind of newborn parents. That clutter definitely shows in photos though. So, it's worth taking a few minutes to organize the space you'll be shooting in. I remove things like phone chargers and alarm clocks from night stands. Or swings from the background of photos, etc... Don't be afraid to rearrange. The photos will come out better because of it. 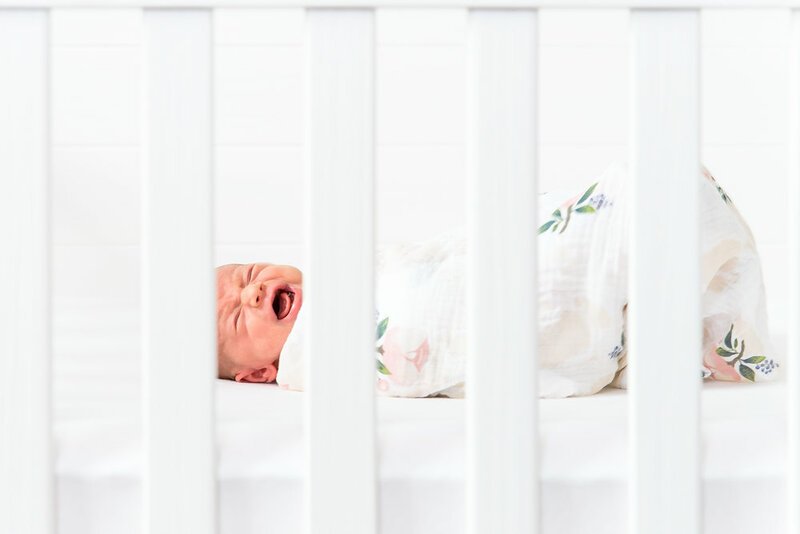 If the baby is crying, don't be afraid to snap a few photos. Depending on their personality, the parents may or may not appreciate it right away, but they will definitely appreciate it a few years down the road. After all, lifestyle photography is about documenting the moment, and crying is definitely part of the moment. It's nice to remember all of the emotion involved. Don't forget to capture the details. Perhaps it's the baby holding her parents finger, or her little nose, or ears, or feet, or fuzzy hair. This might also include details of the nursery. I like including a collage of nursery detail photos. Sometimes if a baby is crying, I use that time to concentrate on the details.